Sept. 19/43 At dawn this morning we once more advance in our usual order, pass over the detour at the canyon, and slowly pick our way through the mutilated Town of Corleto and hit the open road beyond. Recce report another blown bridge ahead so the tank column is halted and Bruce, Slim, Ralph and I go forward to investigate. We find a bridge completely ruined, and a dry rough river bed beneath. This is swept for mines and a road is made for the tanks. The infantry and recce are now ahead of us and we decide to go forward, so cross the detour in our jeep and reach the road on the other side and find a terrific crater, which must be filled before we can proceed. Bruce and I walk forward to the Infantry H.Q. and talk with the C.O. There is a valley right in front of us, and a very heavily wooded hill on the other side, about 1500 yards away. There is a small bridge at the edge of the wood and recce have spotted German sappers at work attempting to blow it. The West Nova Scotias set up a mortar, the F.O. is in position, ready to go, when German covering fire opens up; they have spotted us. There is a hail of machine gun bullets – and only two are wounded, the F.O. in the head, and an Infantry chap in the hand. One mortar goes off, and the first shot blows up a German truck and kills at least one Jerry. Our jeep, in the meantime, has come up, we attend casualties, evacuate the hand case back to the bridge, where he will be picked up by the 9th Field Amb. – return the head case to duty, as it is a trivial wound and prepare to follow up the Jerries. The tanks are having a lot of difficulty getting through the detour, so there is a slight delay and we hear the sickening thuds ahead telling us of more successful demolitions by Jerry and more difficulties for us to encounter. 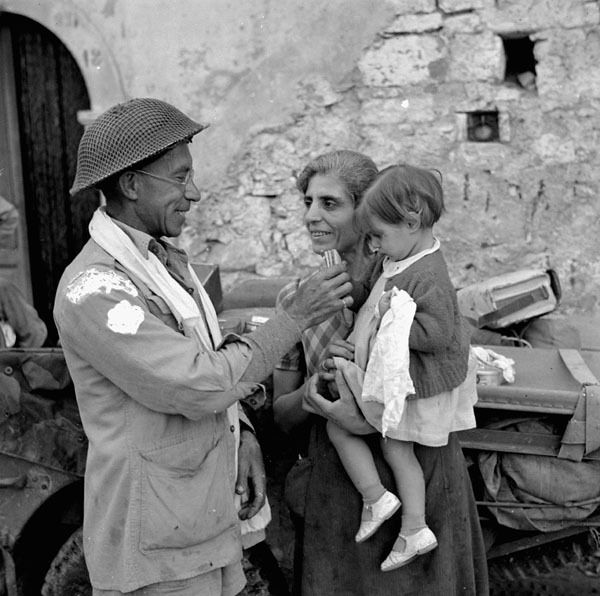 Trooper Ralph Catherall of The Calgary Regiment giving food to an Italian child, Volturara, Italy, 3 October 1943. Finally we move forward again towards Laurenzana, and passing the woody hill, have to crowd past the blazing Jerry car, which the mortar has set ablaze. We continue to advance and very nearly capture a demolition party – the bridge goes up right in front of us, right in the Town of Anzia. The tanks go into action and clear the Jerries from the next stretch of road where they are seen to be laying mines. What casualties were sustained we do not know, but they certainly scattered in a hurry. A detour of this bridge was impossible – it was about 30 feet to river bed and the bridge was only about thirty feet wide. It was completely blown and, so the Engineers set dynamite and blew in the sides and gangs of Italians and soldiers shovelled in dirt until it looked as if a tank could smash the sides in enough to make crossing possible. The first tank over almost stood on its hind legs, but levelled with both edges down a lot. The second tank flattened it out still more, than an Engineer Bren Gun Carrier made the pass, and the fourth vehicle was our Jeep. There were frequent skirmishes with Jerry all along the road: the road and ditches were plastered with mines and progress was very slow. The Engineers go ahead unscrewing the tops from the wooden box mines, and everyone was very careful. We passed two German graves, which look as if they had just been dug, so we imagine at least we killed two of them. 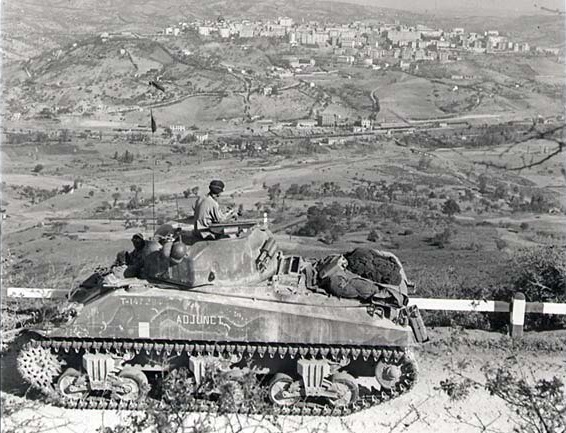 At least we can see Potenza, perched on a hill across the valley from us, the road is very winding, and civilian reports indicate that there are several Germans in the City. It is nearly dark, so we harbour, intending to attack tomorrow. The Infantry will fan out and enter the Town from the two sides, while we will attack, probably at dawn. 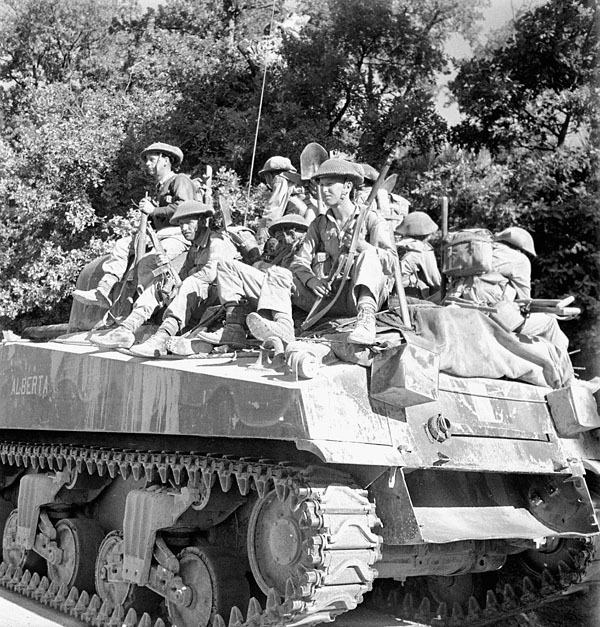 ‘Sherman’ tank of the 14th Armoured Regiment (The Calgary Regiment) leading troops of the West Nova Scotia Regiment across diversion around blown bridge. I believe that there will be a bombardment before we attempt to enter. Italian towns with their narrow twisting streets are certainly not good places for tanks to enter. They can be trapped so easily. At 11 p.m., we get a call to go forward as the Infantry have sustained some casualties. Slim and I go in the Jeep, it is very dark and there is a light drizzle of rain. We proceed down the road into the valley, and find that the West Nova Scotias have eleven casualties scattered around, all caused by German mine explosions. The road is subjected to periodical bursts of machine gun fire – but no mortar or Artillery fire disturbs us. It is very difficult attending to the wounded in the darkness, but we finally get four cared for-load two stretcher cases and two sitting cases onto the jeep and Slim starts back with them to the Car Post. I remain behind and continue working on the others. Finally the regimental medical car arrives and evacuates the last three – one of whom has a fractured Tibia and Fibula. Have just completed the last case when Slim returns again and we load the three cases on and evacuate them to the Car Post, which I find, is nine miles behind us. They had not moved forward as arranged, thus making our work very difficult. Sept. 20/43 – We just return from the Car Post when the tanks move forward, so Slim, Ralph, Art and I fall in behind and once more move into the valley. When we arrive at the spot where the Infantry had been wounded, we find that the column is held up. The bridge on the main road has been blow up and the Engineers are busy sweeping a path across the river bed, over which we can pass to reach the Town. The Artillery moves into position where they can shell the Town we climb the bank and study the Town through field glasses. We pick out several very suspicious spots and range the ranks on them – then the F.O. contacts his artillery and the general bombardment begins. We get word of the parts of the Town in which our own Infantry are advancing and these parts are carefully avoided. We are now sitting in the valley facing the Town. The bombardment is progressing – seven “A” Squadron Tanks are lined up under the command of Bruce Trotter. Ralph, Slim, Art and I are with our Jeep and motorcycle, prepared to move off in a moment behind the Tanks. No one else is visible – what are we going to meet as we enter the Town? We don’t know. 10 a.m. – the forward tank moves off and cautiously crossed the river bed, the next tank in line covering it from about 60 yards distance. We see the first four tanks reach the road and hugging closely the bank of the road, begin to pass towards the forward houses. The tank ahead of us moves off and we fall in line about fifty yards in the rear. There is fairly heavy mortar and machine gun fire coming from the Town – the forward tank opens on suspicious looking houses – each tank in turn takes up the shooting and the whole column presses steadily forwards. We pass the Infantry in the ditches, they tell us the tanks have silenced the machine gun nests and on we go to the foot of the hill. We see the tanks creeping slowly up the twisting road, each tank in turn covering the one in front – the front tank blasting every turnings before twisting around into plain view of what every maybe lying wait for it. The civilians are no where to be seen, but on the final big bend before entering the first City square – hundreds of them appear, leaning over a huge balcony or stone wall. This is at the entrance to a huge air raid shelter. They cheer us, wave flags, should, laugh and cry. They probably have been up in this place for twenty four hours. We reach the first square – the tanks have taken up positions commanding the different streets. An Italian doctor recognizes the red cross on my jeep and comes over and shakes hands. He talks French, so we make ourselves understood. He takes me to a huge air raid shelter and I enter with him – it is terrible – men, women and children, terrified, weeping, cheering as we enter and pass back, for several hundred yards under ground. The sanitation is appalling and whether enemies or not, my heart aches for these people, and I cannot help now but think that their joy on our apperence is genuine. I clawed my way back to the open air and climb a very high set of stairs to the main City Square, where to my relief, I see Bruce Trotter sitting covering all the entrances and old “Alberta” looks very war like in the surrounding – in front of the Governor’s Palace. We grin and wave at each other and go about our jobs. I am the only soldier on foot in the crowd, but am as safe as a baby in arms with those 70mm and Brownings covering me. When I return to the jeep, there is a message from the Infantry that they have several casualties down the side street who need attention, so we go down in the jeep and first boy we pick up has a broken back. We bring him back and place him beneath some shady trees off the square and establish a collecting post.Art Coyle goes back to notify the ambulances in the rear where the casualties will be nested, Ralph stays and cares for the wounded at our post, and Slim and I go on with our work of collecting them. We evacuate all the wounded to this spot, and I go with the stretcher bearer of the West Nova Scotias, remove the identification discs and personal belongings from the dead – hand them in to their own M.O. when I meet him. We have just finished collecting and attending to the wounded when the ambulance arrives to start evacuation. Ralph has done a wonderful job at this post, and I am very proud of the grand work all my boys did and the risks they took without question. A call comes in that our forward tank has been blown up, somewhere forward in the Town, so we go at top speed past the coumln and as we reach the City Square on the very outskirts of the Town we see several wounded. We attend them and rush them back to our post and return to the Square where we run a regular sick parade fixing all sorts of things on tankers and Infantry alike. The spirit between the two Regiments is grand – the friendship developed is very strong. After lunch we pick up a few souvenirs and rummage around before setting off. Lance-Corporal J.A. 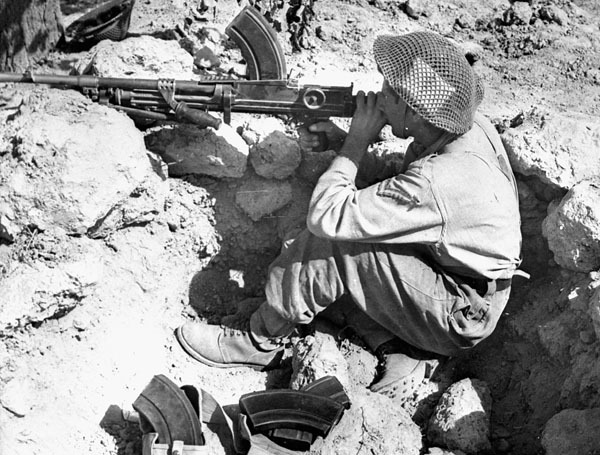 Weston, West Nova Scotia Regiment, aiming his Bren gun across the Foglia River during the advance on the Gothic Line near Montelabbate, Italy, ca. 30 August 1944. Our forward tank opens fire on a retreating German car and gets a little too close to the side of the road and hits a mine which blows its track off and wounds a number of Infantry whom we have just evacuated. We have finished our lunch, and are now pulling forward to the hills to take up a hulled down position. It seems to strange to pass a road sign directing us to Naples. We now are sitting in hulled down position north of Potenza. The City looks very beautiful behind us, the tiny farms and winding roads in front look lovely. Tpr. Baker comes up on a motorcycle with word that theis a wounded American airman down the road; Slim and I get in the jeep and Baker guides us to him. He is young haggard looking chap, so happy to see us that he can scarcely contain himself. He was shot down on Aug. 28 while attacking Foggia – sustained a broken leg and was taken prisoners by the Italians and placed him in hospital. He says the Italians were good to him and removed him to a cave and hid him when Italy signed the Armistice. His pals were carried back as prisoners with the Germans. WE carried him down to our first post in the Town, but as we entered the square we came into terrific machine gun fire coming from the high houses over this first air raid shelter that I had been trying to get in. The Infantry and Provost have gone to ground trying to engage the snipers, we are in the center of the square and must get out quickly. We back up and hug the opposite side of the street and go back into the Town. They did not hit us, but certainly came on all sides of us I believe the face that we were so close below them, we were moving and they were shooting down, made them miss us. The red cross certainly carried no weight with them. 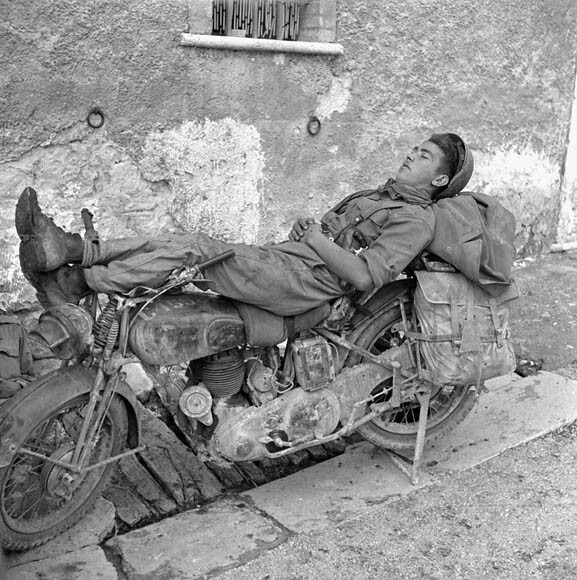 Trooper A.A. Coulombe, 14th Armoured Regiment (The Calgary Regiment), resting on motorcycle. We take the airman back and leave him at the R.A.P. of the West Nova Scotias and then rejoin the tanks in the hills. The Infantry surround the house and mop up the Germans who had hid while we passed through the Town and then came to life again. After supper all the tanks move into laager. We establish in a big hollow right beside a filthy little Italian house. There are no trees, shade, or attraction of any kind here, but we have gained our objective. Potenza is in our hands and the road across Italy from Salerno to Bari is opened up. Our medical supplies are running low, so I must go on the scrounge. Slim, Sgm Reid and I sally forth and go to a big hospital in the center of the Town. One big wing apparently was Military but has been deserted. The other wing across the road is still used for Civilians. I receive a tiny donation from the Civilian wing and then enter the Military. There is a huge unexploded bomb lying in the doorway, parts of the building have been knocked to pieces, but most is in good repair. we leave with the jeep loaded with grand medical supplies and in the afternoon Bruce Trotter and I have return to depart with another full load. On the way into Town we stop at the tank which was blown yesterday, and old Pop La Forge presents me with my “Puma” which proudly rides on the front of the car. We are still sitting on the hill – rumours that we return to England on the 15th of Nov. fly thick and fast – rumours of another advance are also prevalent, but the fact is, until we get enough petrol in from Taranto or Bari, we will sit here. The sky tonight becomes filled with thousands of flashes, we all believe that a terrible bombardment is in progress, but cannot figure it out, as the front apparently seems to be all around us. Gradually it dawns on us that it is a thunder storm – the most peculiar one I have every seen. The sky for hours has been one blaze of flashing light, heavy, heavy black clouds are hanging low – we decide the wind will blow the storm over, so we go to ed in our little pup tent beside out ambulance which has just arrived from the section. The rains comes down in torrents and we are driven from our tents, drenched, and find refuge in the ambulance. In the morning the sky is bright – but oh the mud. We begin to realize that it will not be long before this kind of weather will be the rule. During the week we have had rare scrounging parties – Jimmy Hales, Curly Lynch and I were extremely good at it – we brought back wine of ancient vintage from secret wine cellars, a crucifix and sacks of potatoes. The Town was put out of bounds, so these parties had to close. Bruce Trotter, Don Taylor and I visited the Chief Magistrate one evening and had a grand time. Bruce and I used to go up on the hill for a walk every night and sit and talk until after dark. Sept. 29/43 – At 2 p.m. we move off and rejoin the Regiment in Minvervino, a few miles south of Foggia, which had been captured a few days before. This is a glorious trip – no traffic, no apparent hurry, a beautiful paved highway, a real scenic highway through the loveliest country we had yet encountered. We travel to Graceiona and then to a hill top from which we can see, perched high in a hill on the other side of the valley, the little Town of Tolve. To get from the top of this hill we spiral down about twelve hairpin bends, one above the other. The tanks go straight across, and we in the jeep twist round and round these bends until we are dizzy. After reaching the floor of the valley, we immediately begin to climb the hill into the Town, going round and round again from bottom to top. The Town itself is very quaint, narrow streets, cold uninviting stone houses, and as we reach the outskirts on the other side discover row on row of caves, one above the other all the way down the hill. They are all inhabited. To come out of the Town we once more must descend by a series of very sharp hairpin bends. This is the most peculiar place I have ever seen. About ten miles farther on, we pass through Irsina a good deal like Tolve, only no so many bends. A few miles beyond this Town we harbour for the night. I have seen mosquitoes as bad as in this harbour. we are all relieved when morning comes. Sept. 30/43 – Move off shortly after dawn, and proceed to Gravina where we wait until the rest of the Regiment join us from the south. We then fall in the rear and pass through Minervino, six miles north to the main Foggia line, where we go into harbour. A great part of the 1st Canadian Division is here and rumours are thick about a big advance starting tomorrow. I will get my orders this afternoon at a big order group I have been warned to attend, and perhaps tomorrow will start on another expedition. At the orders group over which Col Neroutsos presided it was learned that a new advance will be by the Canadians along the road leading north west from Foggia into the mountains. Stiff resistance is expected but the Canadian objective is Campobasso, a mountain Town in the very center of Italy about sixty miles north of Naples. The road from Foggia to Campobasso is very steep and winding. The country is true mountain country, with very high hills and deep valleys. There are several towns which must be passed within a few miles of the road, and several towns are high summits through which the road passes. It is most difficult country for an offensive and a very easy country to defend. It simply abounds in natural defences. The first part of the road will be easy, it is over the famous Foggia Plains, which are as level as our prairies, and appear to cover a great deal of territory. This is in all the largest airport in the world, and the airport from which so much misery was dealt our troops in the desert and in Sicily. The Plains of Foggia have already been in our possession for 2-3 weeks and large crews are busy putting the runways in order again, but already parts of it are occupied by hundreds of our planes. Beyond the Plains, the country rises very abruptly and immediately the Appenine Mountains are encountered. This is the forward enemy line which we must attack, and gradually push back to Campobasso. 3. Main Body – the remainder of the 1st Can Div. The whole Advance Guard is under the command of Lt. Col. Neroutsos, and they will act in the following manner. The Van Guard will advance, with the Recce ahead and the tanks in second place. I will go as S.M.O. (Senior Medical Officer) of the Van Guard and will travel by jeep, with Slim and Ralph and have Art Coyle on motorcycle as D.R. (despatch rider). One ambulance will bring up the rear of the Van Guard column. The leading vehicle of the Advance Guard will be six miles behind the rear vehicle in the Van Guard, and the leading vehicle of the Main Body will be six miles behind the rear vehicle of the Advance Guard, thus each portion of the column will be separated from each other by six miles. 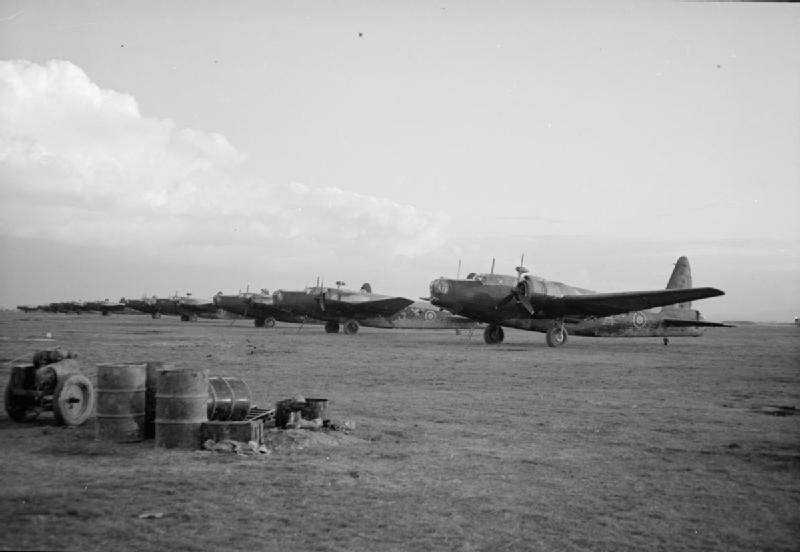 “A” and “B” Squadron – 14th Reg Tanks will be in Advance Guard and will have Capt. Hunter, Bert and Jim in 15cwt and one ambulance. His carrier, 30cwt truck and our section truck will remain behind in “B” Echelon to come up later. Still lying north of Potenza. The artillery are moving forward today, so perhaps we will go tomorrow. We are getting very tired of lying around. There is absolutely no shade on this plain. The most amazing electrical storm I have ever seen tonight. The whole sky was constantly lit up for practically the entire night. Very heavy rain, we got drenched. We are still sitting on the hills north of Potenza waiting for future developments. All sorts of rumours of course. Yesterday received a very large mail – first for I don’t know how long – the atmosphere seems much brighter today. My ambulance arrived to join us today and we have scrounged large amounts of dressings, drugs, etc. from Italian hospitals. 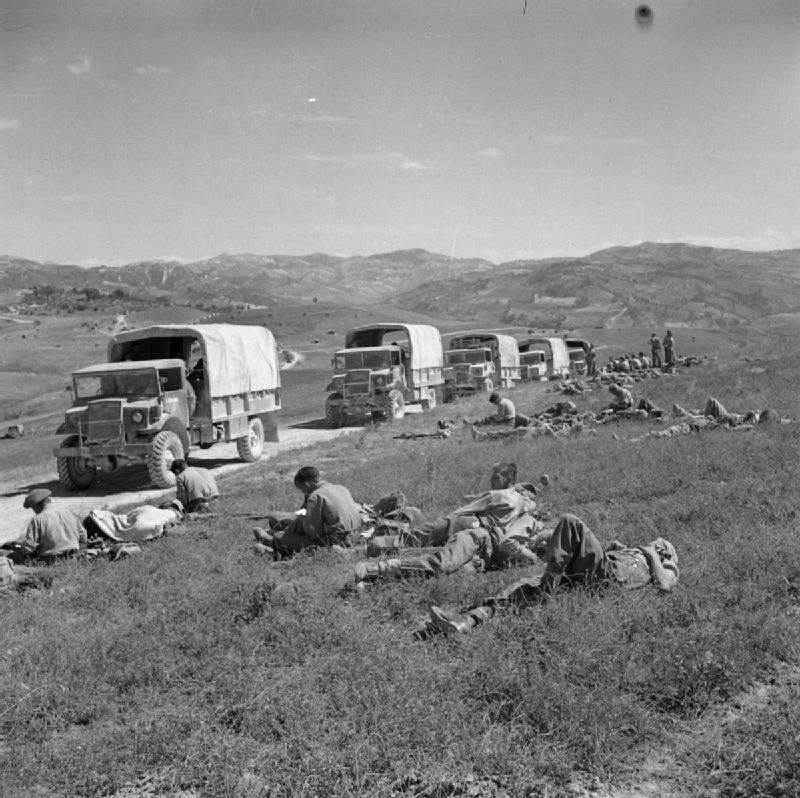 A line of supply lorries and their crews wait to move on during the breakthrough into the Gothic Line, 7 September 1944. On Sept. 17/43 – “A” Squadron – 14th move out from harbour at 1400hrs. WE fall in our usual place behind “Alberta” tank, which Bruce Trotter rides as Commanding Officer. We are only moving forward to our rendevous with the 3rd Brigade and to get into position for the advance, which will really begin tomorrow. We pass due north on the coast road for twenty-five miles, then swing sharply inland, past the little village of Rotondella, which is perched way high on a dome-lie hill and continue straight into the hills towards Colabraro. It is getting dusk, and we are wondering whether we will hit harbour before dark, so that we can cook our supper. Just past the road junction leading to Senise, we draw into a field and set up our stove and have just finished our supper when without warning to us, the tanks pull out and simply fly down the road with us after them, not knowing where they are going or what they are going to do. Eventually we stop and bed down just off the road, having covered 55 miles since leaving harbour. Shortly afterwards the Infantry arrive and we all harbour together in preparation for an early start the following morning. In the meantime “B” Squadron, 14th are preparing to move up the coast towards Bari and expect they may have some tank warfare, so Capt. Hunter in his Carrier, his RAP and the rest of my section remain with them. 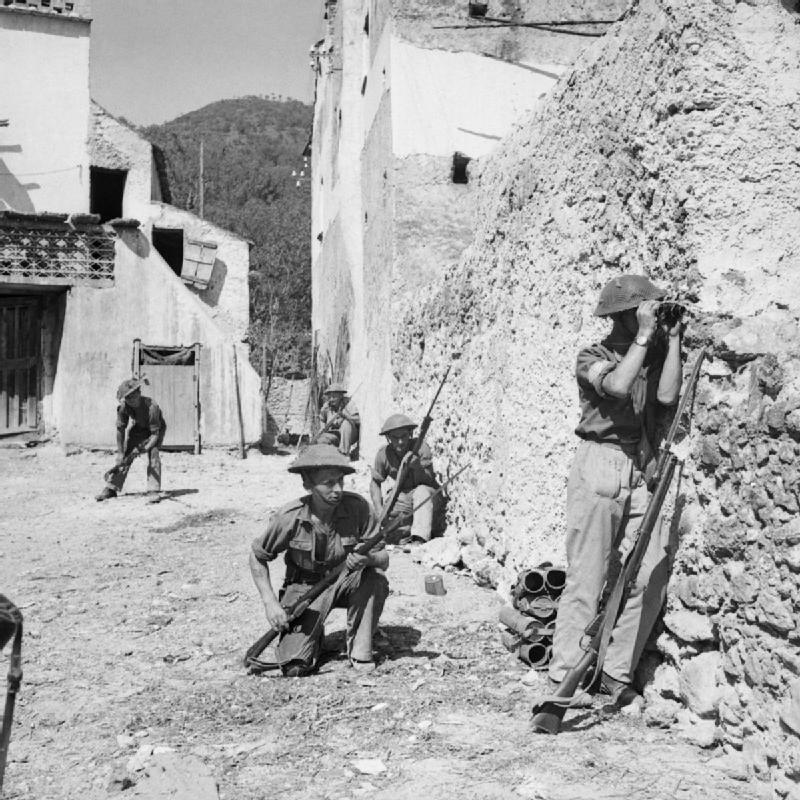 A patrol of the 2/7th Queen’s Regiment enters the village of Pugliano, Italy, September 1943. On Sept. 18 – we woke up and pack before dawn. It is very cold and we have no heavy clothing, so we wrap ourselves in Italian groundsheets and stand and shiver, while the Infantry of the West Nova Scotias load on the tanks, and we prepare to advance at dawn. Our Recce in carriers under Sgt. Jimmy Hales have started out in front, looking for hidden machine gun nests and 88mm guns. at 5:15 a.m. we start forward and proceed without opposition through St. Arcangelo and Missanello, through terribly heavy and hilly country covered by a great deal of bush and scrub. Visibility is poor and progress is very slow. We had hoped to reach the village of Corleto tonight, and the recce discover the only bridge over a very deep and rough canyon is blow, past repair, so Column can’t continue. We pull into harbour, after only advancing twenty eight miles. The recce look for a way across and the Artillery take up positions covering the detour which we must make. The Engineers are busily engaged, digging away the banks of the canyon and moving boulders, so that we can pass down the bank under the bridge and up the bank on the other side. It is very slow work. In the meantime the recce pass forward into the town of Corleto and discover a seriously wounded German officer. It is impossible for a vehicle to get in and Slim and I with our Jeep attempt it, successfully reach the village, remove the Officer and bring him back to the Vac post of the 9th Field Amb. The road from the bridge to the Village is terribly bombed and blown to pieces – streets of the Town are heaped high with debris, the houses are a shambles. I believe it is the worst bombed small village I have ever seen. Hundreds of dead bodies are buried beneath the fallen stone and the familiar odor of death is over everything. There are unexploded mines and bombs everywhere. The mine sweepers and Infantry are busy cleaning the streets so that tanks and soft skinned vehicles can pass through. There does not seem to have been much of importance in this Town and why it should have been bombed so I cannot imagine. Salerno, 9 September 1943 (Operation Avalanche): During 10 – 11 September, the strength of German resistance steadily increased. A counter-attack cut the 9th Battalion, Royal Fusiliers in Battipaglia off from from the main force and required new defences to be created. A gun crew of 267 Battery, 67 Anti-Tank Regiment, Royal Artillery prepare a 17 pounder Pheasant anti-tank gun for action. It is now Sept. 9/43 that we learn of the Armistice – the roads are crowned with Italian soldiers and civilians, all cheering and waving to us. 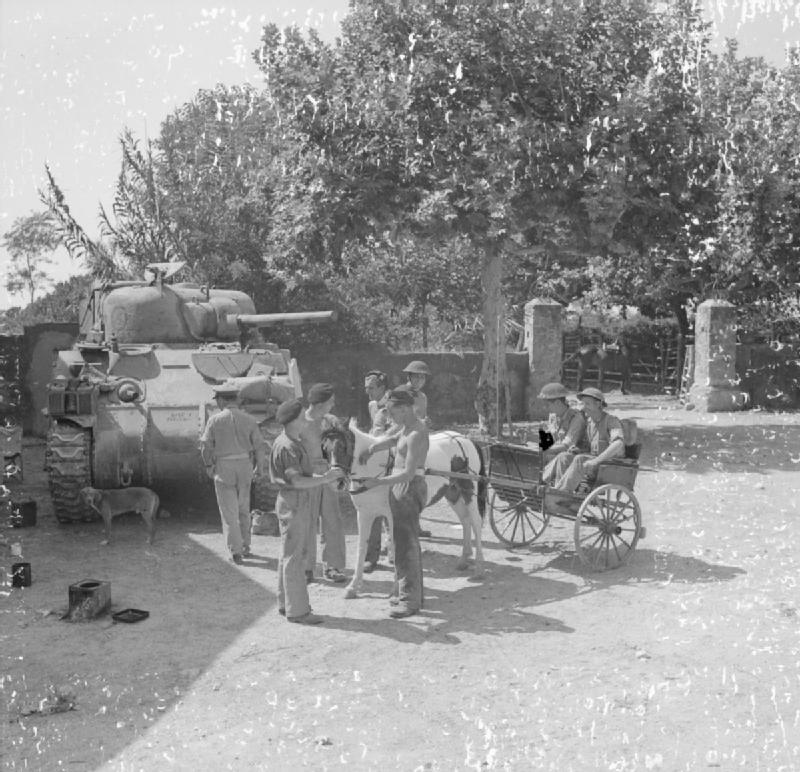 At one village we came into a square containing hundreds and hundreds of Italian soldiers – they stop our car, shake hands – “bravo” us almost to death and actually force us to drink Cognac with them – the war is over for them, but not for us. When I return to Monasterace every one is standing to, waiting to attack. We pass up the coast road about 8 miles between St. Catherine Ionia and Marina di Badolato. We encounter enemy pill boxes and once more the tanks go into action, and infantry patrol are sent into the hills approaching Radiolata. We are expecting action at anytime and are all prepared. I have sent my D.R. Back to move up to the Relay Post and to inform the section at Locri to hand over to the first Medical Unit encountered, and move forward to a point which I would designate later. While sitting in line on the road, a submarine suddenly came to the surface a few hundred yards off shore – we prepared to engage it and a were just on the verge of firing when word was flashed that it was American. Probably a close shave for both of us. As we came forward to a bend in the road, the tank immediately in front of us opened fire, but we could not see what he was engaging, so we stopped and lying in the road ahead of us was a very pretty little red tin can. I got out to take a look at it and a Recce officer saw it too. So we both looked at it and decided it must be an Italian grenade and we had better leave it alone. An Officer Recce came up and took a shovel to throw it off the road and it exploded, wounding him in about fifty places, but none very serious We looked after him and returned him to a Cantoneiri at Radiolata, where we had planted a flag for the others to come by. By now Bert, Jim and Ralph were here to look after any casualties. We all spent the night here and in the morning at 6 a.m. We all spent the night here and in the morning at 6 a.m. we advanced again. 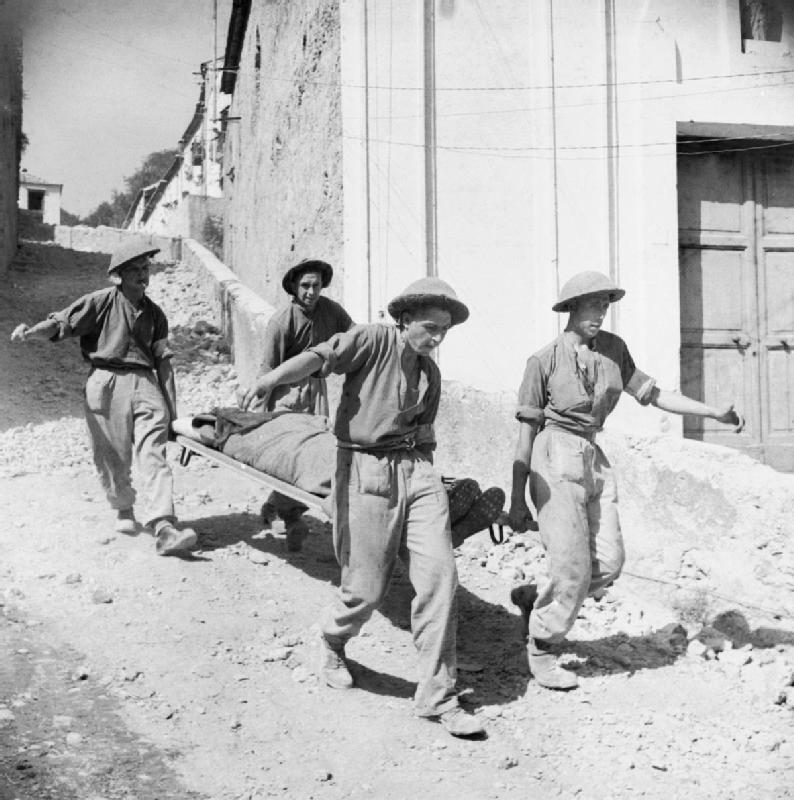 Stretcher bearers carry a wounded soldier to an advanced dressing station in Salerno, Italy, September 1943.
rear a few miles the Section would be coming up, prepared at any time to open up another emergency hospital if necessary. Just as we started, a D.R. arrived telling me the Section that were on the road, had handed over 40 casualties to a 1st Div Field Amb., and would be catching up to us some time that day. Sept. 10/43 – Another flying column is organized to proceed to and occupy Catanzaro, the Capital of the most southern province in Italy – and the military H.Q. of that district. The Column is to consist of Stoney with three tanks, a Co, of Recce and my jeep, but this changed shortly afterwards. It is soon discovered that the beautiful coast road on which we are travelling to Marina Catanzaro, from which a good highway runs to Catanzaro, has been so badly blown, that it is impossible to travel over it, so a detour must be recce through the mountains. The only road possible is a narrow, windy, hair pin road, climbing straight up the high peaks of the Appennine Mts. to a little town of Maccutano (sp? ), very, very old, with tiny crooked, narrow streets, and old stone houses jutting over the road. We climb the mountain to the entrance of the Town and find a terrible turn, by which the tanks have great difficulty in passing. At last we reach the tiny village square and find that the only road out is too narrow for tanks, but we must go on, so slowly but surely the lead tank hammers its way in to the side of these houses, and gradually gets through. The houses have been actually gouged out to make the road wide enough for the Army to advance. This might be termed burrowing your way through Italy. We are given a wonderful welcome in this Town, the people are out by the hundreds, English and American flags are flying. One cute girl is holding a large banner in which is printed “Welcome to the English. Welcome to the Americans.” We are being mistaken for Americans, so I take the banner, scratch out Americans and add Canadians. I feel much better after this. At 5 p.m. we enter Catanzaro, the largest city we have yet seen in Italy. Everything is in good condition – a few but not many signs of war. One struck me as outstanding – a street car sitting with the tracks in front, and behind, blown sky high. The City was crowded with soldiers and high-ranking officers; everybody curious, but neither hostile or enthusiastic. I proceeded at once to the big Military Hospital where the staff were drawn up. I went to the Col. in charge and by means of an interpreter requested the right to search the hospital and records for either English or American prisoners of war. Found hat he had had several, but they had been removed by the Germans a few days before. I then asked for medical supplies and a car. He took me to the Camp Commandant and I got a sedan – returned to the Hospital and loaded it up with a wonderful stock of supplies and started on after the Column. I had only gone about a mile when I had a flat tire, no spare, and while trying to fix it, another tire went, so I picked up my supplies, threw them on one of our trucks which was passing and went on without the car. Got a good horse laugh over that too. We set up a small A.D.S. (Advanced Dressing Station) in a lodge at the gate of a ground where we have gone to harbour. Catanzaro is our objective and it is taken in the record time of one hundred and fifty miles advance by Armour in four days. That night we find two kegs of Cognac and give the Column a well earned rum issue – then turn in for the night. Sept. 11/43 – My Recce Sgt. friend comes over in a stolen car and we proceed back as far as Locri to check all our posts, just to be sure that nothing has been overlooked. We had a grand trip down, but the entire 1st Div. had by now moved from the West coast, through the mountain road to Locri, and were advancing towards Catanzaro. On our returned we found “A” Squadron in harbour at Monasterace so had lunch at the R.A.P. (Regimental Aid Post) and returned to Catanzaro. Orders were out for a move in the morning to Catanzaro Marina for reorganization, so we decided to evacuate our patients from our little ADS back to “A” Squadron Ambulance at Monasterace, and have them evacuate further down the line to Locri. The road was so terrible for night driving, and in teh day would be so crowded with traffic, I decided to send the Ambulance at dawn. Sept. 12/43 – After evacuation of our casualties, we moved the 30cwt, the 15cwt, the jeep, and motor cycle down to Cantanzaro Marina, and established both an RAP and ADS. That afternoon we were visited by Gen. Simmons, G.O.C. – 1st Div., who gave us a talk, and told us it was not impossible that the war in Europe might be over by the first of the year. We are camped in a beautiful grove, on the shores of the Mediterranean. The swimming is lovely and we are all enjoying a good rest. The Army Post Office arrived today and we all sent cables home. We have rearranged our medical supplies – have given a complete set to the 14th (Calgary Regiment) and have built up such a wonderful reserve in our section, that our worries in that respect for awhile are over. Sept. 14/43 – The line across the instep of Italy has now been established, the 8th and the 5th Armies have made contact from coast to coast, and now are going to make a further move of one hundred and fifty miles – purely a regimental move and from there, further action will be expected. The 5th Corps have already Taranto and soon the heel will be in our possession. The next move will no doubt be to straighten out the line in preparation for the attack on Naples and Foggia. We are still bathing daily in the Gulf of Squillace – and what beautiful bathing it is. Sept. 15/43 – Regiment moved off at 7 a.m. – “F” Group, the Tanks in the lead, with Capt. Hunter, carrier and one ambulance. “A” Echelon one hour later, with Bert and Jim in a 15cwt and “A2” Echelon one behind that with Ralph, Slim , and I with the jeep, Art with the motor cycle, our 30cwt and section, and the other ambulance. We pass north east along the coast through Passo di Trocellio, then inland through Cutro, north east again to Crotone, north to Strongoli, and still north along the coast road to Cariati, on the shore of the Gulf of Taranto. There were several demolitions along the road, making many detours necessary. The country during the first part of our journey is very barren and mountainous with huge herds of gray oxen. On the last twenty miles of the journey we passed through the most beautiful olive groves I have ever seen, and at night we came to harbour in one of them. This morning we took the lead in “A2” Echelon and carried Sgt. Major Kerkam as a passenger. On our first halt we planted our Italian staff and flag, and unfortunately we drove and forgot it – one mighty good souvenir lost. Where we are harboured we are infested with dirty, ragged civilians, searching our garbage for food, begging, stealing and in general making a terrible nuisance of themselves. One boy woke up just in time to see a woman running off with his boots. There are thousands and thousands of Italian soldiers around wandering in every direction like lost Souls. I suppose they are wondering what next. So are we. We covered 92 miles today. Sept. 16/43 at 1900 hr. We moved off north in the same order as yesterday and passed through Corigliano, a very filthy little Town, then followed straight north to the Cross Roads leading to Castrovillari, where we harboured in a pine grove on the shores of the Gulf of Taranto. A short trip today of only 45 miles. The swimming is glorious. Tonight 3 L.C.T.s (Landing Craft Tank) loaded with 2nd Brig. Infantry pull into our beach, but cannot get close enough to shore to unload, so pull out again and proceed down the coast for a few miles to the next little town. The campaign in Italy has now been on for two weeks, we have advanced over two hundred and seventy two miles, the first big phase is over. 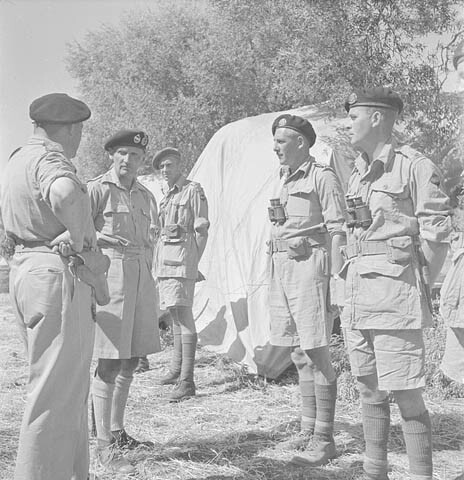 “B” Squadron have had their show, “C” Squadron is still in Sicily, “B” Echelon is still in Sicily and we do not know where the Bde (Brigade) or 2nd Field Amb is. “B” Squadron under Stoney have put up a wonderful show. I know that “A” will too – and when it comes to “C” Squadron under Bob Donaly, I hope I am able to take part also. “B” Section of the 2nd Field Amb have certainly done a grand job and the next shows, I have every confidence they will show up equally as well. Still sitting north of Town. Do not know what our future course is. Sept. 19: Went forward to the West Nova Scotias this a.m. Got into German fire. Two men hit – at least one German killed. Moved up to Laurenzana, skirmishes and mines. Road blown at Anzi. 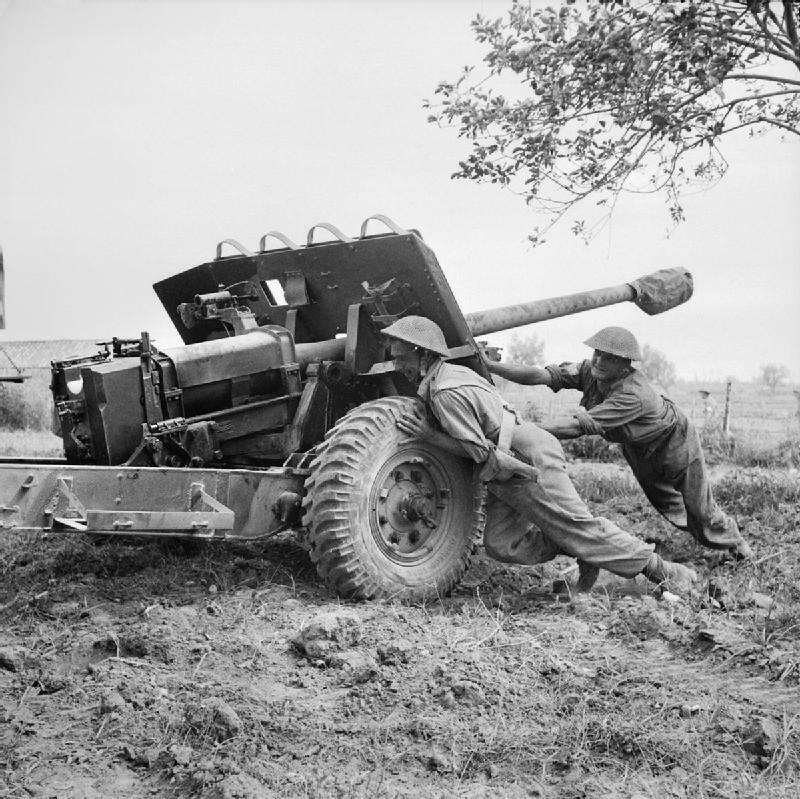 Went in with West Nova Scotians as they attacked Potenza – had quite a few casualties., mines and blown bridges everywhere. Sept. 20: We are now sitting in front of Potenza. There is some machine gun and mortar fire. We have been shelling the Town. The bridges are blown and we are making detours. Expect to move in with four “A” Squadron Tanks in a few minutes. Moved 50 miles yesterday. Moved off at 10 a.m. behind seven “A” Squadron Tanks and passed over a detour to road, then after the Tanks had blown up the front houses which lodged the machine guns we all passed in to the Town. It was badly knocked to pieces and mined. I went into an air raid shelter and found hundreds of civilians lodged there. Their welcome certainly brought a lump to my throat. We established a collecting post in first city square and evacuated several W. Nova Scotians. Also found several of their dead and removed their personal belongings and handed them in and reported their location. 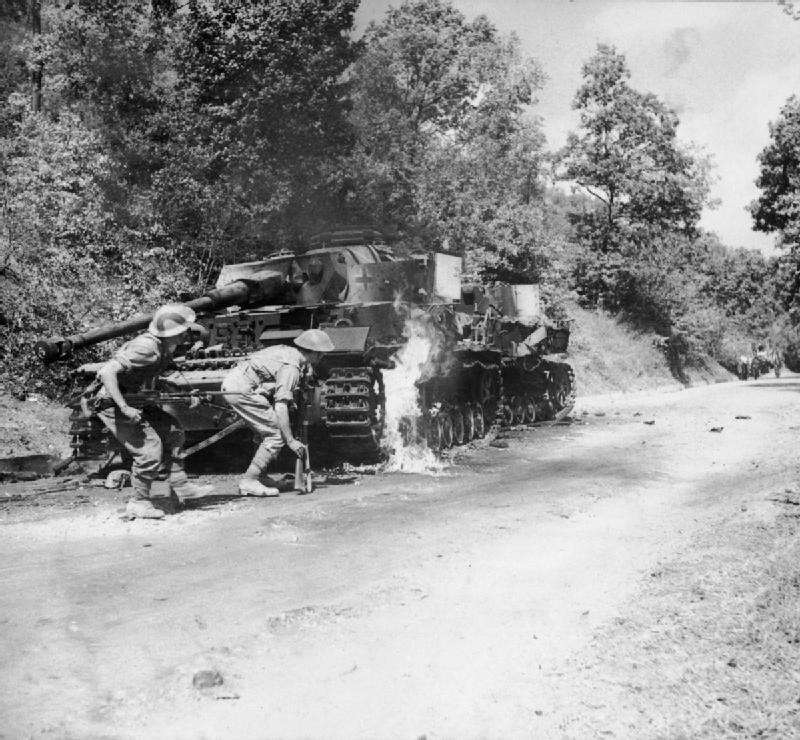 One of our Tanks was blown up by a mine with casualties to infantry on the outside. At 1 p.m. the City of Potenza was in our possession and we moved north of Town and took up covering positions north of the Town. Got called back in afternoon to attend an American Air Force chap who was shot down Aug. 28 – had been a prisoner in hospital here until just before we came – then escaped, even though he had a broken leg. We tried to get him to Collecting Post but came under such heavy fire we had to go back. The Infantry finally cleared up the snipers in the Town who had hidden until we passed, then opened up.